Former Member of Ukraine's Parliament Dmytro Kriuchkov, who is suspected of embezzling state funds from energy generating companies, will be provided a security detail, notified of suspicion and a motion will be filed in court recommending pretrial preventive measures, chief of the Specialized Anti-corruption Prosecutor's Office (SAPO) Nazar Kholodnytsky has said. Kholodnytsky did not say when exactly Kriuchkov is expected to arrive in Ukraine, but said that SAPO and the National Anti-corruption Bureau of Ukraine (NABU) will take all necessary procedural measures involving the former deputy. "He is not currently in Ukraine. All measures for bringing the suspect to court are being taken," Kholodnytsky said, adding that, "in light of the latest statements made…, everything will be done so he can give testimony, which he intends to do." He said Kriuchkov will be notified of suspicion of committing crimes under a number of articles of Ukraine's Criminal Code, including Article 191 (misappropriation, embezzlement of property or taking possession of it through abuse of official position). "A petition will also be filed with the court to elect a preventive measure in the form of detention with an alternative to bail," he said, adding the amount of bail proposed would be the amount of damage for the crimes committed. 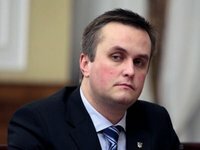 MP (Bloc of Petro Poroshenko faction - BPP) Serhiy Leshchenko wrote earlier on Facebook that on Monday evening "the main person involved in the investigation of billions of dollars in theft of tariffs from state power companies, Dmytro Kriuchkov," would be extradited from Munich to Ukraine. As reported, investigative journalists from Radio Free Europe/Radio Liberty's TV program Schemes: Corruption in Detail said Kriuchkov in 2015, through the company Energomerezha, which he managed, organized schemes for withdrawing funds from state energy supplying companies (regional energy companies) for Ukrainian businessmen Ihor Surkis and Hryhoriy Surkis, as well as a MP Ihor Kononenko, a BPP member. Kriuchkov is suspected of committing crimes under Part 5 of Article 191 and Part 3 of Article 27, Part 2 of Article 364 of Ukraine's Criminal Code. He was detained in Germany on July 14, 2018, but was soon released on bail. Kriuchkov later agreed to the extradition procedure and was again imprisoned. NABU reported on the preparation of a package of documents necessary for the extradition of a suspect to Ukraine. On March 29, 2019, Ukraine's Deputy Prosecutor General Yevhen Yenin told Interfax-Ukraine that the Prosecutor General’s Office (PGO) had sent a request to Germany for his extradition. Last week SAPO said Kriuchkov would be extradited to Ukraine on April 15.